These lightweight clamps are used for small diameter applications including air and fuel lines. Streamlined configurations allow installation in tight fitting or difficult to reach areas. Creates high sealing pressure with only 10-15 in. lbs. torque. Stainless steel 5/16 W band. Sold in quantities of 10. 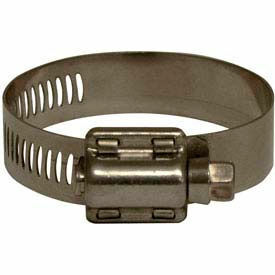 The Original Stainless Steel Worm-Drive Clamp! Offers heavy-duty 4-piece Quadra-lock construction that enables more tightening torque to be delivered to the band perforations. Used for aircraft and heavy-duty industrial applications. Type 301 stainless steel band is 9/16 W. Sold in quantities of 10. Power Seal Clamps, Plated Hex Screw: General Purpose Automotive and industrial clamps. High Strength 4-Piece Quadra-Lock construction. Exceeds all SAE requirements. Use for all standard clamp applications. 1/2" (12.7mm) band. Type 301 stainless steel clamps offer high corrosion resistance necessary for marine, underground and other corrosive applications. 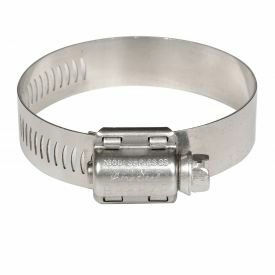 Available in 9/16 or 1/2"W Type 301 stainless steel bands. 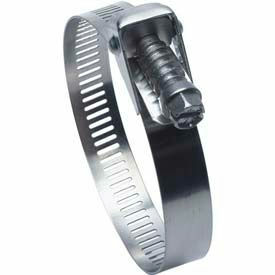 Includes Type 305 stainless steel hex screw. Sold in quantities of 10. 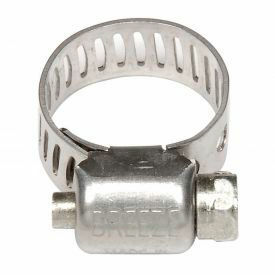 Breeze Liner Clamps Give The Truest Concentric Seal Of Any Clamp Made! Protects soft-surface hoses, such as silicone, from damage caused by extrusion. 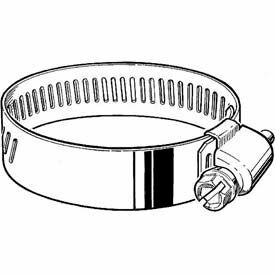 Integral band extension with inner protective liner prevents shearing through band slots. 1/2"W Type 301 stainless steel bands. Choose between 410 Stainless Steel or Plated Hex Screw. Sold in quantities of 10. The Strongest Worm-Gear Clamp Made In The World Today! Withstands more than 4 times the SAE torque requirements for Type F worm-drive clamps. Eight screw-threads are engaged in the band simultaneously for incredible torque drive (over 150 in. lbs. ), sealing pressure, and vibration resistance. 5/8"W Type 304 stainless steel bands. Includes 410 stainless steel screw. Hex Screw Clamps are sold in quantities of 10; Extended Range Clamps are sold 1 per package. Breeze Constant-Torque Clamps Are The Solution For Leakage And Rupture Caused by Temperature Changes. Breeze Constant-Torque Clamps are designed to react to changes in hose systems by increasing or decreasing in diameter as the system expands or contracts. Clamps prevent leakage and rupture problems caused by cold flow, or changes in environment or operation temperature. 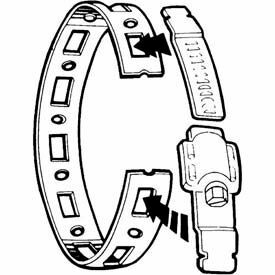 Choose between 5/8"W or 9/16"W Type 301 stainless steel bands. Also available with 410 Stainless Steel or Plated Hex Screw. Sold individually. Make-A-Clamp Systems Are Used For Varying Sized Clamp Requirements. 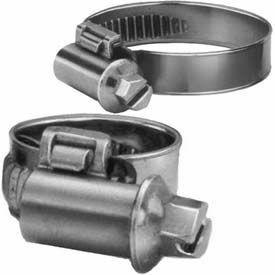 Reusable 100% stainless steel worm-drive clamps are made with 1/2"W Type 302 stainless steel band with type 410 stainless steel hex screw. Works by cutting off a piece of banding from a continuous roll. Allows cutting banding to a needed size. Available in 8.5', 50', and 100' band rolls. Performance engineered for long term durability and manufactured to the highest quality standards. 3/4 W Type 301 stainless steel band with plated hex screw. Sold individually. 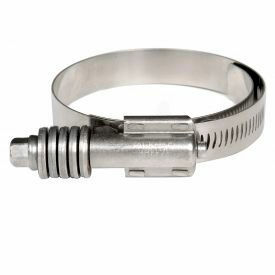 Precision Brand® 316 Grade Stainless Steel Hose Clamps Are Used For Highly Corrosive And Salt Water Environments. 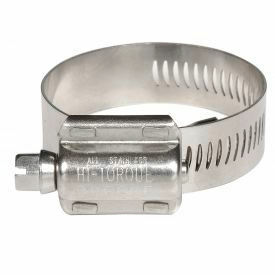 Precision Brand® 316 Grade Stainless Steel Hose Clamps are made of 316 grade non-magnetic and rustproof stainless steel for long lasting durability and dependability. Help prolong hose life in multiple plumbing applications. Include 316 stainless steel hex head screws. 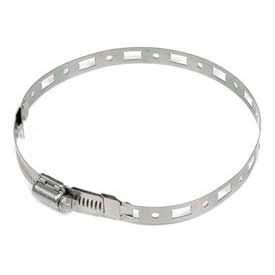 Available in wide variety of 7/32 to 7 inch adjustable clamping diameters. Package quantity is 10. 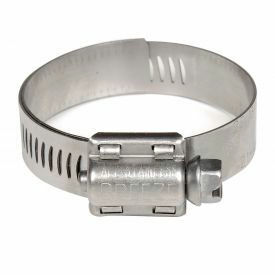 Precision Brand® Collared Screw Hose Clamps Satisfy A Wide Range Of Fastening Applications. 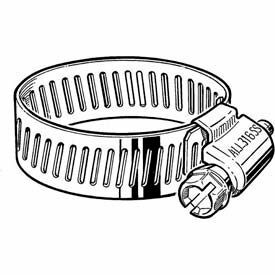 Precision Brand® Collared Screw Hose Clamps are constructed of 300 series stainless steel band and housings with zinc plated carbon steel hex head screws for long lasting durability and dependability. Safety collared screws eliminate danger of screwdriver slipping and damaging hoses. 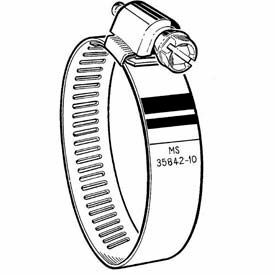 Wider band provides more sealing surface area than conventional bands. Can be used with blade and nut type drivers and socket wrenches. 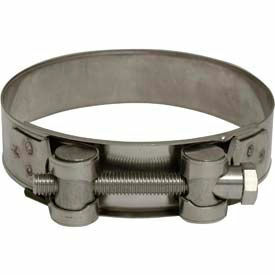 Available in wide variety of 3/8 to 4 inch adjustable clamping diameters. Package quantity is 10. Precision Brand® Create-A-Clamps Are An Used, Easy Way To Solve Almost Any Clamping Problem. Precision Brand® Heavy Duty 3-Piece Hose Clamps Are Used For Automotive, Plumbing And Heavy Duty Industrial Applications. Precision Brand® Heavy Duty 4-Piece Hose Clamps Are Used For Marine, Plumbing, Agricultural And Heavy Duty Industrial Applications. 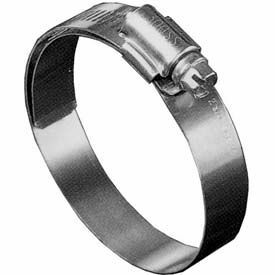 Precision Brand® Metric Hose Clamps Provide More Efficient Sealing At Lower Torques. 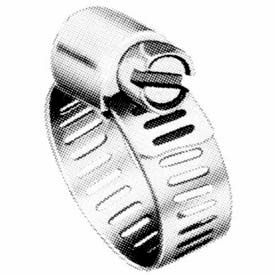 Precision Brand® Military Standard Hose Clamps Are Used For High Vibration And Heavy Leakage Applications Including Industrial Machinery, Heavy Truck, Marine and Farm Equipment. Precision Brand® Miniature Series Hose Clamps Are Used For Hard To Reach Areas Preventing Damages To Hose Walls. 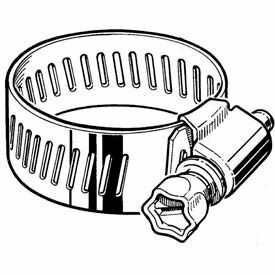 Precision Brand® Quick Release Hose Clamps Are Used In Closed Areas Where Clamp Must Be Disengaged For Installation And Removal. 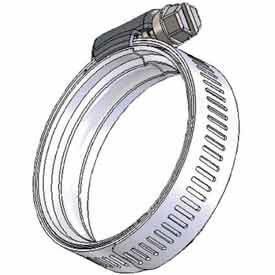 Precision Brand® Shielded/Lined Hose Clamps Provide Inner Liner Covering Band Serrations Preventing Damage To Soft Hose Applications. 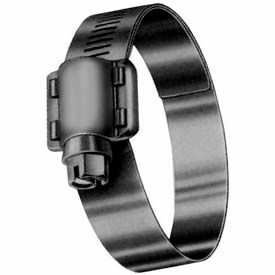 Precision Brand® Standard Series Hose Clamps Are Easily Installed With Screwdriver, Nut Driver Or Socket Wrench And Used For Most Clamping Applications. WaveSeal 360™ provides unique expansion and contraction to create a steady 360° seal in response to changing temperatures and works well with non-uniform hoses. Two inward pointed ridges form points of high pressure, and between them a low pressure center that creates an O-ring effect. 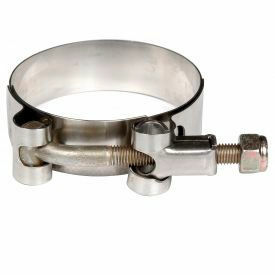 This stainless steel clamp has a 5/16" hex head screw and the 9/16" band width offers a greater sealing area. Commonly used with hydraulic, cooling, and charged air systems. 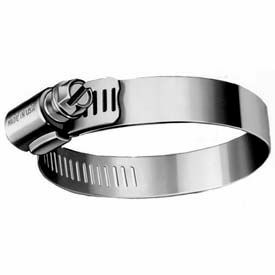 Apache™ Band-It Clamps & Tools Are Used For Industrial And Commercial Applications. 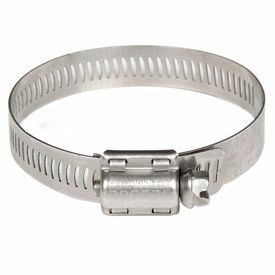 Apache™ Stainless Steel Worm Gear Clamps Are Used For Construction, Agricultural And Industrial Applications. 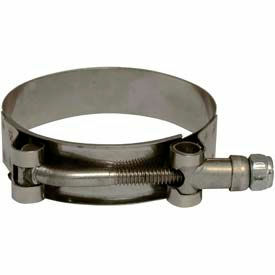 Apache™ Stainless Steel Ultra T-Bolt Clamps Are Used For Industrial And Commercial Applications. Stainless Steel Ultra T-Bolt Clamps are constructed completely of high-grade stainless steel for long lasting durability. T-bolt is threaded the entire length to allow for maximum range of size and tension. Clamp will handle high torque, creating even sealing pressure around the coupling shank. 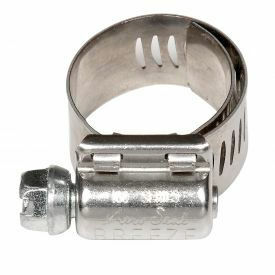 Includes nylon locking nut. Available in min/max diameters 1-5/16"/1-11/16"-4-9/16"/4-15/16"
Apache™ Stainless Steel H.D. 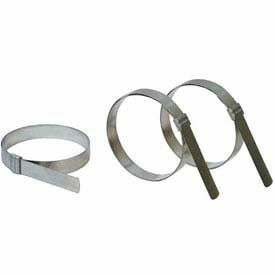 Super Clamps Are Used For Agricultural, Irrigation, Municipal, Industrial And Mining Applications. Stainless Steel H.D. Super Clamps are built tough for rugged environments and long lasting durability. Clamps feature 3 spot welds for added strength. Bridge provides 360-degree even pressure sealing surface to eliminate leakage. Bolt hex and thread are metric and require no special tools to install. Available in min/max diameters 1.73"/1.85"-4.8"/5.12"